The peplum reigned supreme on the runway this season and looks set to be big for autumn winter 2012 too! Whether worked into a blouse, jacket or dress, the flared design is this season’s must-have detail! The feminine simplicity of the detail really accentuates a woman’s natural curves. Can be worn in a blouse with casual trousers or smartened up in a tailored dress for work or a special occasion. Keep detailing on the upper body to a minimum and let the peplum do the talking! Check out the celebrities who have been wearing the trend below (Blake Lively, Emma Watson, Jessica Biel, Olivia Palermo, Kate Middleton, Jennifer Anniston). Hover over the bottom of the image to replay slideshow. If you're ready to rock this trend then check out these fabulous peplum styles below that are ready and waiting to be snapped up! For a simple, timeless take on the trend go for this gorgeous top from ASOS. Great for work with a pencil skirt or glam-up with skinny jeans - whatever you wear on your bottom half keep it super fitted! For a more casual take on the peplum trend this bird print top from Oasis will bring you right up to date. For a more feminine look this pretty chiffon top from ASOS is a great buy. It has pleat detail down the front, exposed zip on the back and a double hemline - love it! Add a fun, feminine jacket to your collection with this gorgeous design from ASOS. Made in jersey it's not only super comfortable but with the fitted peplum design it's super stylish too! This gorgeous dress by Hybrid features a folded peplum detail and being knee length makes it wearable for all. Perfect for a wedding or a day at the races! This fabulous skirt by Warehouse will add some serious style to your wardrobe. 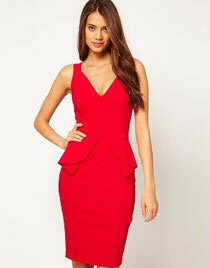 With a high waist, flared peplum frill and fitted pencil skirt to the knee, it is sure to show off every curve.